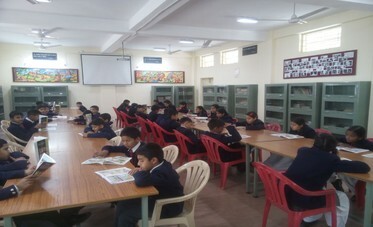 At present school has two libraries, primary and senior library. Both the library has equal size with sitting capacity of 40 students in each library. Number of users – about 2,700 students and 90 staff. Daily circulation – about 300 books. Each class from 1st to 12th has a library period in their time table. Students come to the library during their period to get the books issued or returned. Basic need of users is related to their school curriculum, story books, fictions, reference books etc. The library is using the Library software name E-Garnthalaya. We have continued upgrading the library software. The library has student resource center with six computers for students use with LAN and internet connectivity. The library is open every school day from 08:00 a.m. to 03:00 p.m.
Every class from I-XII is allotted library periods. The students can use the library, read newspapers and magazines, consult reference books and issue the books during their library periods. The books can be returned to the library at any time. Besides the students may utilise the library during their free time provided no other class is having a library period at that time. Normally books will be issued to a student for a period of 14 days. An overdue charge of Rs. 1/- per day will be charged in case of willful delay. Staff members can have a maximum of 5 books for a period of one month. The primary section from Class 1-5 is having class libraries also. The class teachers will be provided with enough number books as per the level which may be utilised during the library periods. Magazines for the primary section are separately provided. Library periods are there for every class starting from VI to XII. During library periods students can issue and return the books. The students are encouraged to maintain their reading lists and to submit book reviews of the books they have read. Class libraries are functioning from I to V. The teachers in charges of the respective classes select books from the library according to the academic standard and reading habit of the students. Books are provided for each class and the teacher concerned will distribute the books to the students during library periods. The books can be changed from the main library from time to time. Some books are gifted to our library by staff, students and publishers. We put these books in our library by giving them a special accession number started with “G” and maintain their record in separate ledger called gifted books ledger. We encourage students to donate their old books in good condition so that they can help other children also. WE introduce a concept of Drop Everything And Read (DEAR). To support the students, we focused on reading habit, and have started to add more high interest fictions and story books etc. and these have been used constantly. The library organises the regular quizzes for the Quiz Club members. (NIE) The Times of India Student edition, a customized student newspaper exclusively for the students, pack of content that leads to a smarter and learning experience. This Newspaper gives education a new dimension by simple reading habit. We are able to provide newspapers to classrooms to connect students to the real world. 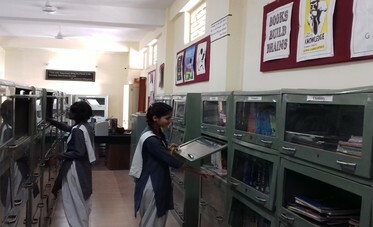 Effective management and utilisation of the library resources in a School Library requires incorporation of modern technologies as the Librarian alone has to do all the tasks in the library. This always causes delays in assisting the students to get the information they require as well as circulation of books to maximum number students in library periods allotted to the classes. To facilitate the effective use of books the School Library has started computerisation with the Library Management Software “E-Granthalaya” developed by National Informatic Centre. The software provides facilities for catalogue search, circulation of books and magazines, reservation of books, reports, fine collection, library statistics etc. Reports on the books issued, reservation status, search book by member and accession number, book suggestion and selection, budget expenditure and more. 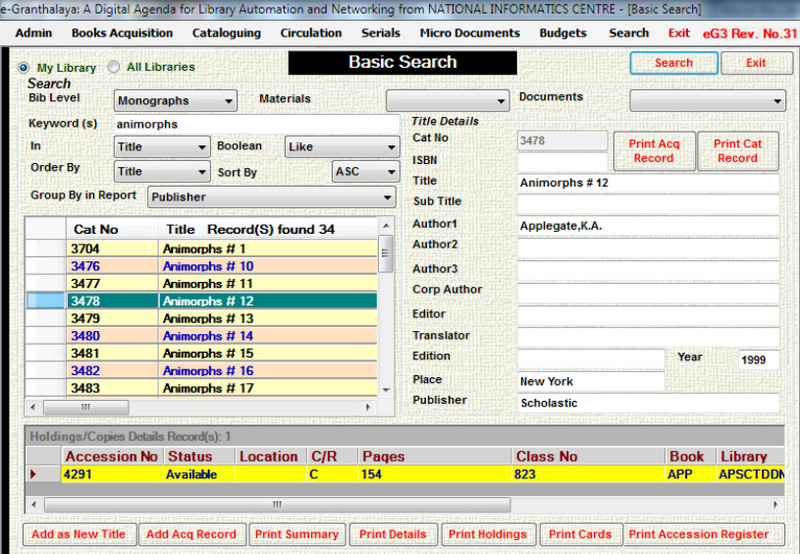 All the library resources are barcoded. In search text box, type the title of the book, subject, author or any keyword or word in the title and click Search button. The books will be displayed with details like status of availability, to whom issued. If you find any useful book which is not available in your library, feel free to suggest the book in the suggestion register. CAN I DONATE A BOOK? Of course. Your donations will help us to strengthen our library collection. Donate only books which are in good physical condition. WHAT DOES ‘G’ STAND FOR IN THE ACCESSION NUMBER OF A BOOK? ‘G’ stand for ‘Gratis’ which means free and all the books received free of cost to the library will be entered in a separate register and will have the prefix ‘G’ with the Accession Number. WHAT DOES ‘T’ STAND FOR IN THE ACCESSION NUMBER OF A BOOK? ‘T’ stands for ‘Text book’ it will be entered in a separate register of Text Books and will have the prefix ‘T’ with the Accession Number. CAN I ISSUE A BOOK OTHER THAN OUR LIBRARY PERIODS? You have any question/doubt regarding Library services or anything related to Library/Books/Reading? Go ahead and ask the Librarian. Pests.org is a resource hub for you to learn more about specific aspects of pests and the threat they present. The guides and resources provide you with critical information to help you identify a pest, evaluate the threat, and determine a solution. Helping Hand will show you the way to success by paving a safe a secure passage through the turns and twists of the text in the text book. A blog providing information on contests/competitions and scholarships for Indian School students. A guide that goes in depth about resume organization and how to create a selling personal brand statement. This site offers classic fairy tale stories by the Brothers Grimm, Hans Christian Andersen and Charles Perrault, going on to the morally edifying fables of Aesop and Jean de La Fontaine, and ending with the wisdom, gathered by the people: the folktales from different parts of the world. You may gift a book to your library The Student can donate any book(s) he or she likes to the library. The student will announce the book in the Morning Assembly. Planet PDF– A small collection of classic novels all in PDF format. Free-ebooks.net is an open resource to download free ebooks in multiple file formats.